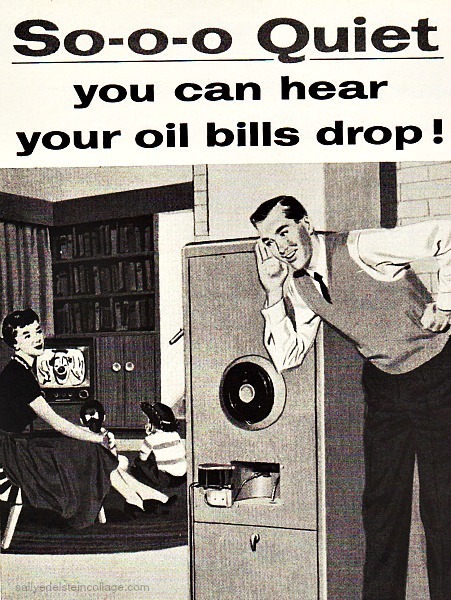 As the winter chill begins to set in and we reluctantly turn up the costly heat, its hard to imagine that in mid century America oil was still the biggest bargain in American’s budget. The second Sunday in October 1957 an unexpected chilly nip of fall was in the air. Some blamed the unseasonably cold blast on the Cold War. Sputnik, that Russian satellite that was currently circling the globe was sending chills down Uncle Sam’s spine, toying with Mother Nature. 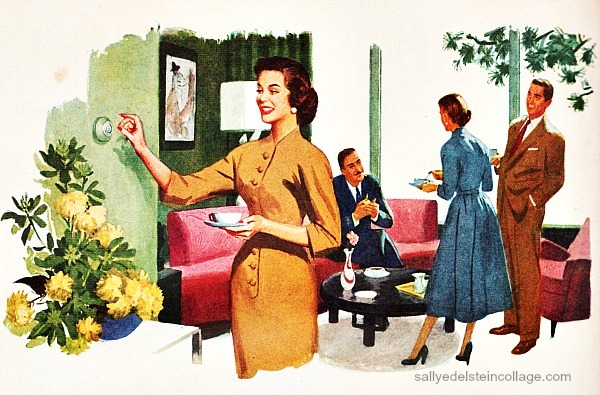 At home, Mom turned on Ed Sullivan and turned up the heat, raising the temperature on our new modern Honeywell EZ-read thermostat to a toasty 78 degrees. Admiring the new thermostat’s snap-off cover cleverly painted to match our Ken- Mor painted walls, it was a decorators dream. Designed by none other than industrial giant designer Henry Dreyfuss, it made all other thermostats obsolete. The humming sound of the oil burner churning was a satisfying one. Turn that heat up as high as you like lady! No need to break the bank keeping toasty! In fact in honor of the upcoming American celebration of Oil Progress Week, Dad proudly nudged the needle up to a balmy 85. Oil was still the biggest bargain in the American budget. 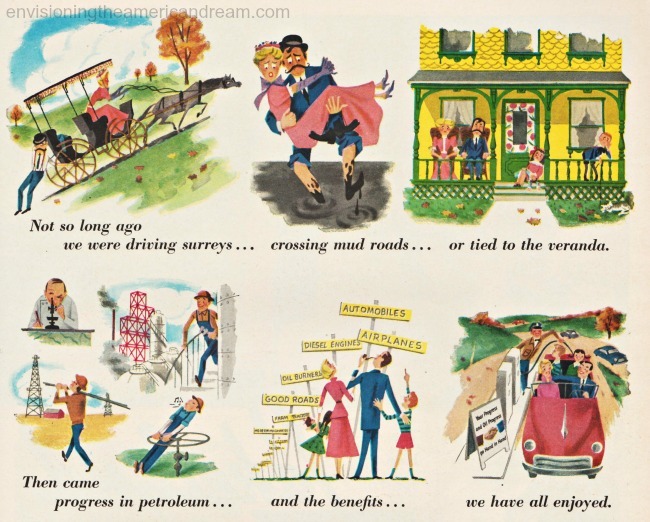 Oil would fuel the American Dream. 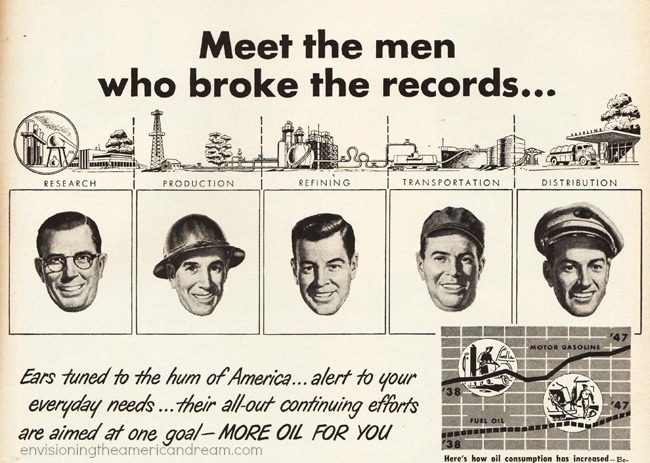 American oil men were always finding new and better sources. Mother nature applied the cookie jar technique to oil, Dad would explain to us. Most of it, she hid away out of our reach. Laying it on thick, they continued to rhapsodize about how much oil we consumed. “Look about your community- and you’ll see why America is now using more oil products than ever! Your service stations-supplying gasoline and lubricants to more motor vehicles than ever before” it boasted. “Your local fuel oil suppliers- delivering heating oils on a round the clock basis to home, schools, hospitals,” it bragged. And your industries…farms…planes and trains- all using more oil than they’ve ever used before,” they crowed. All of these things- and more– are being done so that you will get the oil products you want…when and where you want them! 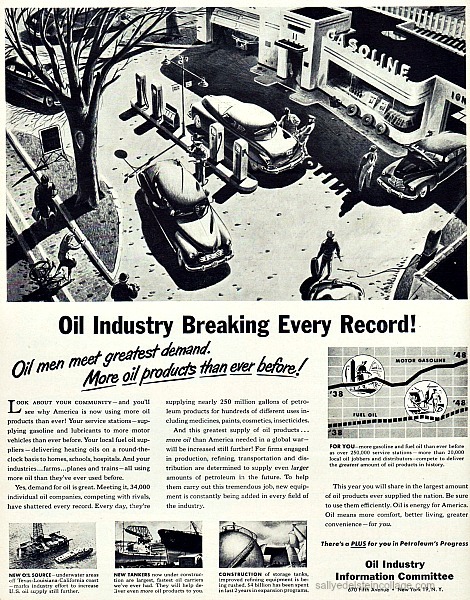 “Oil means more comfort, better living greater convenience- for you,” and bigger profits for firms determined to supply even larger amounts of petroleum in the future. Your future in Fossil Fuels is ensured! .© Sally Edelstein and Envisioning The American Dream, 2013. Unauthorized use and/or duplication of this material without express and written permission from this blog’s author and/or owner is strictly prohibited. Excerpts and links may be used, provided that full and clear credit is given to Sally Edelstein and Envisioning The American Dream with appropriate and specific direction to the original content.